Yup I said it. The cat is out the bag. My husband cheated and I stayed. Don’t get me wrong I was hurt, angry and mad as I don’t know what. I stayed after the affair without a 7 figure settlement, but you better believe I would have gladly taken the money. My reasons to stay had nothing to do with money, it was all about a covenant and love. Despite the affair, I loved my husband. Many call me a fool, but that’s their opinion. At one time I was one of those people.The sister snapping her fingers and shaking her head saying what I would never do.”I would never stay if he had a baby on me.” I have learned to never say what I would not do. That’s why I wrote the article entitled, ” Never Say Never”. You see, not only did I have to deal with the affair, there was an innocent child conceived during the affair. Adultery is nothing new, it happened in the bible days and it will continue to happen. With all the buzz around Tiger Woods and his wife Elin, it’s a wonder Elin can even breathe. It doesn’t matter if it’s one woman or ten, when a wife first discovers an affair, it’s as if someone has punched her in the stomach and the air in the room quickly is scarce. We try to find an escape route out of what seems to be a nightmare. In the coming weeks I will share tips to overcoming an affair in your marriage/ relationship. If Elin decides to stay, it’s her business and no one elses. The pain in just knowing is heartbreaking, but to discover in the spotlight with millions watching your every move, just adds salt to an open wound – a wound that hasn’t had a chance to heal. My prayers are with Elin and the millions of Elin’s out there. Stay tuned as I share how I made it through in the weeks to come. Stay connected and sign up for my newsletter. Cry if you must, even scream, yell and shout. But when you are done, make sure to LIVE, DREAM & BREATHE AGAIN !! PS. 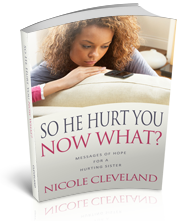 If you don’t want to wait for all the tips make sure to pre-order my brand new book ” So He Cheated, Now What?”, a guide to overcoming an affair in your relationship.